Freshen up your booth or table at Craft Lake City this summer with a DIY inspiration from other makers. The presentation you display at your booth says a lot about you and your product. Festival-goers will see your display before they see your product. Make sure to do your work justice by displaying it in the best way you can! Whether you have a booth or a table, you can easily spruce it up with some DIY touches at this DIY Festival. Displaying your work in a unique way can draw attention to your table! This is an easy DIY for any hanging products, and it could add some height and color to your display! A DIY Festival alumnus, Christina Williams, created this easy (and cheap!) backdrop for her booth and we loved it! All you need is paint, paper plates, and glue. It’s a great and easy way to add some color to your backdrop. A riser can work miracles to a display. Making more of your product visible to passers-by will benefit you greatly. A flat display is harder to engage with. This DIY display riser is a simple fix! Speaking of cheap and easy—use an old umbrella to display! 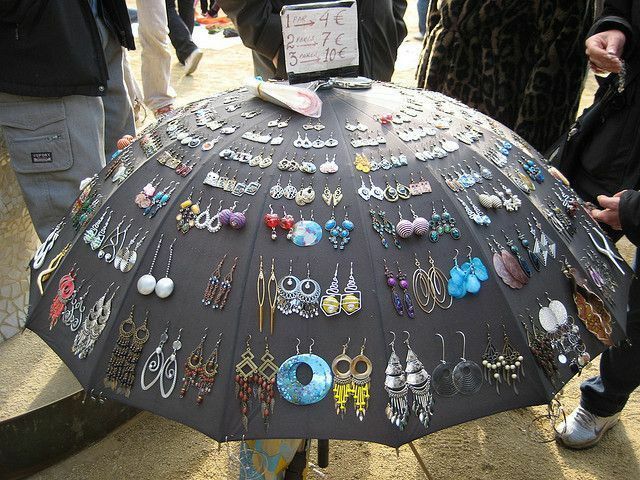 This maker used their umbrella to display earrings, but you could use it to display pins or other jewelry too! This could be a rotating display, optimizing on the space you have. Any umbrella you use will be pretty useless for shielding you from the rain after you poke holes it in, so make sure not to use your favorite one! Another use for the ever crafty pegboard. But shelves in your pegboard to display cards, prints, pottery, or any 2D or 3D art. This way, you can remove or rearrange any shelves. It’s certainly a good investment that can be used at multiple markets and festivals! Have a table at the DIY Festival this year? You can still have shade with this DIY tabletop canopy. This display will not only help your table to stand out but can provide some of the always coveted shade in August. This DIY ladder shelf could be a valuable addition to any booth. Keep it a classical neutral color and let your work stand out, or add a little color to your booth with a brightly colored shelf display. It’s an easy way to maximize space and display more product. Having your business cards on display is always a good idea. You’ll have a chance to spread the word about your business to thousands of festival goers. Many opportunities can come long after the festival has ended! Make sure to display your business cards in a way that will get people’s attention, like with this easy little display. A colorful wall shelf made of crates? Yes, please! Visually, a display like this would draw in a customer, and then let your awesome product do the rest! Though it may be time-consuming to paint this display, it would be pretty simple to assemble. Plus for clean up, all of your stuff is already boxed up! Have any other ideas for booth or table DIYs? We’d love to hear them! Share with us what you’re making for Craft Lake City’s 10th Annual DIY Festival on social media with the #clcdiyfest. We love to see creativity come to life in your work. We may even repost it! Get to work DIYing your space, and we’ll see you in August. We are makers!